By Prof. Michael Herity MRIA. 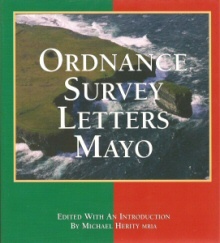 Ordnance Survey Letters Mayo, edited by Michael Herity, Published by Fourmasters Press, Dublin, June 2009. €75. Fourmasters@eircom.net. The Ordnance Survey Letters are regarded as the best source for local history in Ireland. Reports written from the field mainly by John O’Donovan, an exceptionally gifted scholar born on a small farm in south Kilkenny, and the unsung Thomas O’Connor, a young hedge schoolmaster from near Carrickmacross in Monaghan capable of quoting accurately passages from Homer’s Iliad, they were written in the evenings after long walks through the countryside searching out and questioning informants capable of giving authentic and accurate information about the original Irish forms and meanings of townland names and local antiquities. The recommended spellings of place names were entered in Name Books, civil Parish by civil Parish. From these they were copied at the headquarters of the Ordnance Survey in the Phoenix Park by the 60 engravers who made the copper plates from which the first edition of the six-inch maps were printed. All this was done in a well-organised system supervised by a very able military man who continued for thirty years to give great service to Ireland, Thomas Larcom. So these Letters are comprehensive, covering 29 of the 32 counties of Ireland (the exceptions are Antrim and Tyrone, the maps of which were printed before the idea of sending O’Donovan into the field was thought of, and Cork, the largest county and last to be mapped). They were written between 1834 and 1841, well before the Great Famine destroyed so many of our traditions. They were composed and contributed to by an exceptionally gifted and ambitious group of Irish scholars, O’Donovan and O’Conor, O’Curry and O’Keeffe, with a backroom staff including George Downes, George O’Lawlor, the indexer of so many volumes, George Petrie and James Clarence Mangan, who had previously worked as a scrivener in a lawyer’s office in Dame St., and the artists Wakeman and Du Noyer. And O’Donovan often wrote cameos about the characters he met in the field, like Hennelly, whom he met at Ballintober. The present printed edition, limited in number and edited direct from the original Manuscripts, which are now in the Royal Irish Academy, distinguishes between the contributions of the various authors and authorities, particularly between the material written in the field and material copied by scriveners from older printed and manuscript sources in the Dublin libraries and edited with scissors-and-paste into the Letters. One set of most interesting material in the present Mayo volume is the stories written for O’Donovan by Hennelly, the hedge schoolmaster of Ballintober Abbey, in which quotations in Irish are written in phonetic English script. O’Donovan continued in Killala and Rathfran, while O’Conor went first east to the O’Dowda country of Killgarvan and Attymas, then west to Cross-Patrick, Kilcummin, the tribal centre at Mullafarry, and finally D·n Briste, where he quoted at length from McParlan’s Statistical Survey of the county. On May 25th, O’Donovan parted company with O’Conor to visit on the Mullet peninsula ‘the celebrated father Lyons’, who had promised him every assistance. As well as assuring him congenial company in comfortable quarters, this enabled O’Donovan to see and report briefly on the Promontory Fort with chevaux-de-Frise of Dunnamo, to visit Brendan’s hermitage on the island of Inishglora and to record the results of Dean Lyons’s investigations on the Inishkeas. He also took down the story of Deodruisg and Dun Briste at Lyons’s dictation in the local Irish dialect. O’Conor moved south from Ballycastle past Nephin via Nephin and Foxford, staying a night at the Pontoon Hotel; then Swinford, Ballaghaderreen, Claremorris, Ballyhaunis and Castlebar, while O’Donovan took the western route south to Westport and Ballinrobe. They met at last at Ballinrobe on August 10th, where, having compared notes, O’Donovan wrote an essay of over 100 pages on the ancient territories of the county. They wrote up the remaining Parish reports on Mayo at Tuam in late August before moving on to begin work in county Galway.